Water Sense was a coming together, a sharing of experience, a dance of molecular exchange, and a summertime evaporation. Water is liquid, solid and gas. Water is the oceans, lakes, seas, icebergs, rain clouds, rivers, puddles, inside sinks, and inside hoses. Water is used to drink, clean, cleanse, purify, to cool off, put out fires, and cook with. One of our earliest sources of power was the water wheel. Water is used in industrial processes and for stabilizing nuclear power sources. We water plants, we water ourselves. Without water we slow to nothing. Water produces steam, waves, rain, and snow. Water flows, rises, and falls. We can not survive under water, but we also can not survive without water. During an exhibition about the senses of summer I presented an opportunity to share water. 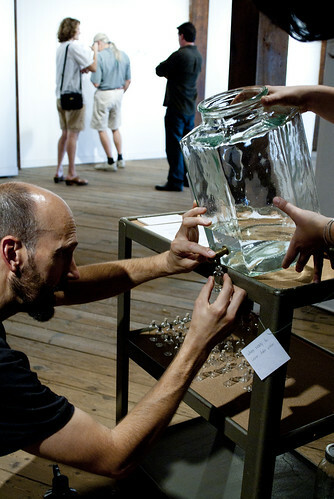 People were invited to bring a small amount of water from a water source that is meaningful to them to the Collar Works Gallery. Participants poured their water into a vessel where it merged with everyone else’s and recorded the source of their contribution in a water log book. These samples of water will came from different places where they look very different, but looked the same when combined. Participants took a small vile of water from the joint water source to watch it evaporate on their windowsill, to water a plant with, to freeze for later or to send back into the world however they chose. What water remained was left to evaporate with the remaining days of summer and returned to the atmosphere to be shared by all. This performance was inspired by and re-contextualized from water ceremonies I participated in at the Unitarian Society in Schenectady, NY.